As part of a national day of action, where around 32 protests were held outside the offices of Federal MPs in every state and territory, Yarra Climate Action Now and friends gathered outside the office of Lindsay Tanner, Member for Melbourne and Finance Minister. The message was clear, we want a climate change policy from the Federal Government that doesn't lock in failure and catastrophic climate change. We want the Federal Government to listen to the scientists and the community, not the powerful polluter lobbies. What's at stake is no less than the survival of humanity. 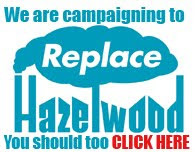 For more information on why the Carbon Pollution Reduction Scheme is worse than nothing, see the post below. For coverage of the protest see the second half of this article (please note, the article gets the name of our spokesperson wrong, and the name of our group wrong - you've got to love lazy journalists). Co-author of Climate Code Red, David Spratt addresses the crowd. The Climate Emergency Service band performs. A protester lets Lindsay Tanner know he'll be held accountable over the Labor Party's inadequate and anti-scientific climate change policies. A summary of all the protests around Australia is available here. To see a video of the protest the day after these protests at Hazelwood Power Station, click here. This is a great post! Would you be interested in seeing your work about local places syndicated on local news blogs? See Fitzroy for example. Many local bloggers are contributing. There’s no advertising and no exploitation of your content - just a convenient way for local people to read local news. To contribute please add suburb categories, tags or labels to your posts, such as ‘Fitzroy’, ‘Brunswick’, etc and let me know you’ve done this. RSS feeds for these tags are created and added to the local news sites. You may find that syndication brings more traffic to your blog and more comments from readers! Switch off the CPRS, Switch on 100% Renewables!